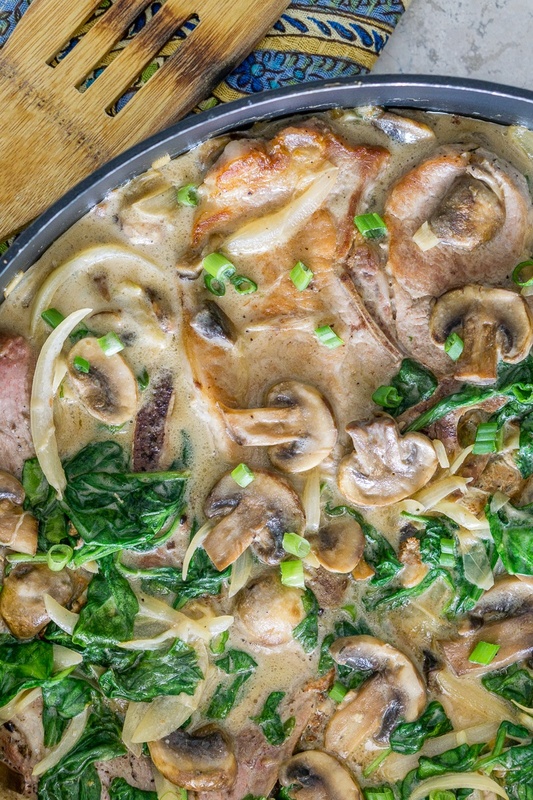 Tender mushroom pork chops are smothered in a creamy mushroom sauce with wilted spinach. A one-skillet dinner recipe that is ready in just a half hour from start to finish, this recipe doesn't use canned cream of mushroom soup, and is gluten free. Season the pork chops generously on both sides with salt and pepper. In a large skillet, heat the vegetable oil. Gently place the pork chops into the skillet and cook over high heat for 5 minutes on each side. Do not disturb the pork chops while cooking so that a nice golden brown crust can form. Carefully remove the pork chops from the skillet onto a large plate (it is OK if they are not fully cooked yet). Add the butter, mushrooms, onion, and garlic to the skillet and stir fry over medium-high heat for about 5 minutes. In a medium bowl, whisk together the chicken stock and the corn starch until no corn starch clumps remain. Make sure you whisk constantly and add the corn starch slowly! Add the chicken stock + corn starch mixture and half and half to the skillet, and stir. Add the baby spinach and stir. Cover and continue cooking for 2-3 minutes, or until the baby spinach starts to wilt. You might need to stir a few times to get all the spinach covered in the sauce and wilted. Add the pork chops back into the skillet and cover with the creamy mushroom-spinach sauce. Cover with a lid and cook for 2-3 minutes, or until the pork chops are fully cooked. Remove from heat and garnish with scallions or parsley leaves. Serve warm, spooning the mushroom sauce over the pork chops and over your favorite side dish.